It’s popular these days to advise folks that they ought to “color outside the lines,” though submitting to that counsel often leads to feeble displays of chaos. Sometimes, though, carefully placing the ordinary out of context can help your story. It’s not so much a matter of disregarding boundaries as of accentuating the strangeness of what lies beyond them. Sometimes the very ordinary stumbled upon in a very wrong setting can transform a story from a mere progression of events to a series of harmonic changes foreshadowing a change of key…. I flatter myself that I did this with a particular scene in my first good novel, The Dust Will Answer. In it, the protagonist, Lenny Strasser, and the importunate acquaintance whose missing girlfriend Lenny’s helping to track down, have ended up in the vast and empty concrete bed of the Los Angeles River well after sunset. They have just sweet-talked their way out of a sequestration in an underground passage, imposed by the one-eyed henchman of a nefarious malefactor (I’m trying not to spoil too much of the story should you choose to read it–and you should choose to read it! ); the lower end of the tunnel , which opens into the riverbed, was guarded by a friendly hobo that Lenny knew from earlier forays into the warehouse district where the action happens. Suffice to say that Lenny and his impedimentary friend eventually find themselves in a pale sunken trench of immense breadth just as the full moon starts to rise over the railyard on the far bank. As they walk to where they’ve been advise by said kindly hobo there is a break in the fence that hems in the river, they suddenly hear what Lenny recognizes from a recent record purchase as one of the Bach solo sonatas for ‘cello. Now these musical pieces are in themselves far from unusual; in fact they have been on the Top 100 playlist of the Western world for a good three hundred years. In a concert hall, they would be perfectly ordinary and expected. 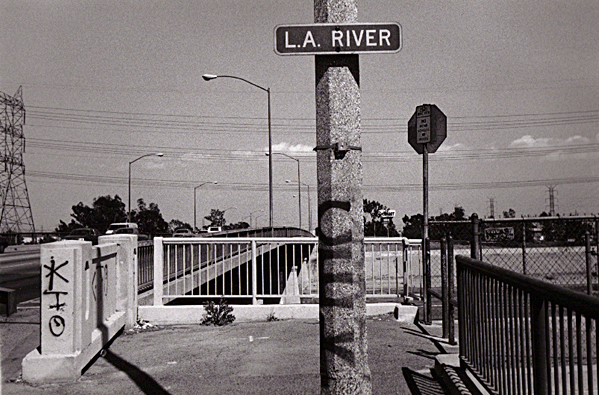 In the LA River, less so. A few more steps provides the rational explanation: an experimental concert by a downtown music school. Of course, it takes place near the promised break in the fence, through which musicians and audience have entered. Lenny would prefer to stop and listen, but alas, there is a quest to attend to, and his companion is no music lover. Up they climb–to discover that the one-eyed henchman has overheard their negotiations with the guardian at the lower end of their confining tunnel, and is waiting for them. Differences of opinion being what they are, an altercation ensues, accompanied by the sounds of Bach, and adding some percussive elements of its own. Lenny prevails–for the moment– and on they go. This is not a gratuitous passage. It marks the story’s movement into an emotional darkness much deeper than the night they now wander through. From this point on, whether the plot line moves through day or night, the context is shadow. The concert’s presence in the wrong place marks a portal beyond which everything ordinary is not right, and everything that should be strange makes sense. Before, the story was just a mechanical quest; after, it is a tale of the reordering of perceptions. That’s what makes the novel work. Yet every element in it is indisputably feasible, and even likely. It’s not so much a matter of coloring outside the lines, as of drawing new lines to fill with color: creating your own world out of the world that everyone knows. Next To the Finish Line!